Bannon calls on Jewish conservatives to help topple Republican establishment, blames leadership for Iran deal. Steve Bannon, the executive chairman of Breitbart News and former chief strategist for President Donald Trump, has called upon American Jewish conservatives to join his effort to oust Republican leaders and upend what he has called the “GOP establishment”. 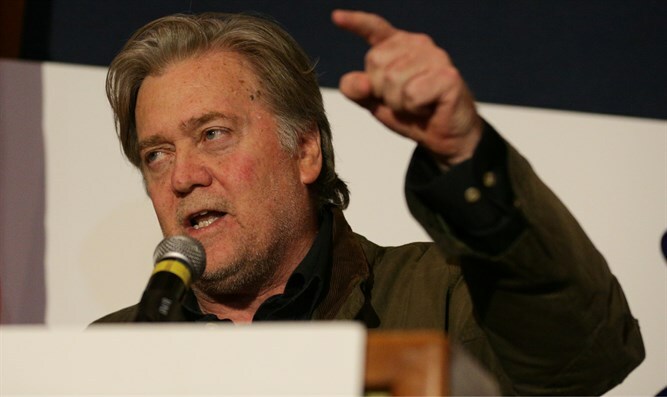 On Sunday, Bannon delivered an address to the Zionist Organization of America’s annual awards dinner, urging the ZOA and other like-minded Jewish conservatives to “work as partners” with Bannon to bring about a conservative revolution in the Republican party. Bannon, who has accused the GOP of “globalism” and advocated reducing immigration to the US and reining in free trade, is considered a staunch supporter of Israel, and pushed for the Trump administration to honor the president’s 2016 campaign promise to relocate the US embassy to Jerusalem. While some left-wing critics accused Bannon of harboring anti-Semitic views, citing accusations made by his ex-wife during divorce proceedings, senior Breitbart News staff noted the large number of Jewish writers and editors employed by Bannon at the right-leaning media outlet, and Breitbart’s strongly pro-Israel outlook. At Sunday’s ZOA gala, Bannon called on pro-Israel conservatives and Jewish Republicans to join his effort to promote primary challenges against what he has described as “establishment” candidates. “We’re leading an insurgency movement against the Republican establishment,” said Bannon. Bannon said the 2015 Joint Comprehensive Plan of Action (JCPOA), better known as the Iran nuclear deal, signed by President Obama, was a result of weakness by the GOP leadership.